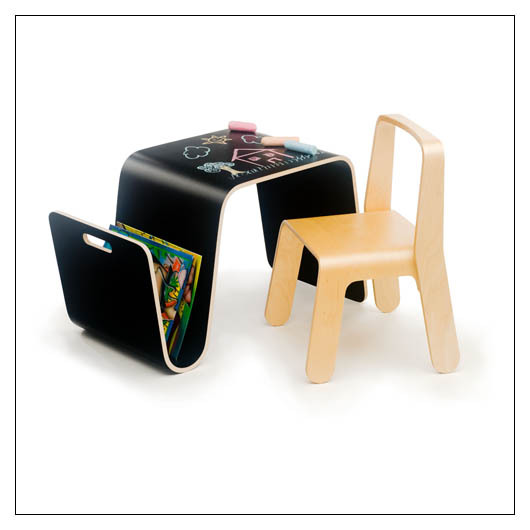 Mag Table (High Pressure Laminate) (MAGTBLHPL) at Pure Design Kids / Toys / Chalkboards ::: Kids' Toys, Furniture and More at Pure Design Kids! Offi's iconic Mag Table is now available with a black high pressure laminate surface. While preserving the beauty of the shapely curves that have made the Mag Table a mainstay in the modern home since 2001, the added durability of the laminate surface makes it perfect for the Kids' room. It doubles as an easily cleaned chalkboard table and a desk with a side storage place for coloring books and the box of crayons. Look-me Kids Chair sold separately.